Replacing your OEM headlight bulbs to a more powerful halogen will provide you with far better visibility for night driving. Replacing halogen headlight bulbs is a straight forward task and can transform your car with the desirable xenon white look. The best headlights bulbs are the Philips Diamond X-treme Vision, which are available as a H4 or H7 bulb and are proven to produce 130% more brightness. Many car owners make the common mistake of assuming halogen bulbs are the same as LED headlight bulbs. Installing an LED may require an adapter to fit in your current headlight unit, might not be street legal and may not even fit at all. Upgrading to xenon white headlight bulbs will provide additional visibility on the road, brighter light and an improved more modern look and feel. Unlike HID kits there is no need for additional power supplies that need to be installed in the engine bay. The color temperature for the desirable white light output is between 3,000K and 4,000K. Below 3,000K would emit a yellow light output whereas over 4,000K would result in a blue or purple light, which may not be street legal. Replacing your stock headlight bulbs is fairly straight forward with no complicated installation. Below is a list of the best headlight bulbs that provide better visibility for night driving along with a more aesthetically pleasing light output. Philips is a brand that dominates the halogen headlight bulb market and they provide a wide variety of options. The diamond X-treme vision is their highest performing bulb, which they claim provides 130% more light on the road compared to stock bulbs. Considering that this halogen headlight bulb is able to provide similar performance to HID, no wonder it is so popular. Compared with a HID kit, these are easier to install, don’t blind other motorists and provide a natural white light from the headlights. Overall, the Philips X-treme Vision are the best headlight bulbs for night driving with an additional 130% of light compared to standard bulbs. The most popular halogen headlight bulbs that Philips produce are the Crystal Vision bulbs. They are DOT compliant and provide bright light for night driving and a cool blue light output when switched on during the day. 18 different sizes you are able to install these halogen headlight bulbs in various location including the fog lights. These Philips bulbs are fairly distinctive with the blue cap at the end of the bulb that creates the blue tint to the brightness. They are DOT compliant unlike HID bulbs and provide an excellent source of xenon light at a budget price. For those that are looking for the brightest headlight bulbs, PIAA may be the best option. Unlike the Philips alternatives, these produce an impressive 110 watts of light from just 55 watts of power, which is double that of the Philips bulbs. For those that want the best halogen headlight bulbs possible, it doesn’t get much better than these PIAA bulbs. The main drawback is that they are more than double the price of most Philips bulbs but for peace of mind, PIAA provide a 1 year warranty. Sylvania is another popular halogen headlight bulb brand and they provide another performance based alternative. The Silverstar Ultra 9004 is designed for excellent road visibility and clarity compared with OEM headlight bulbs. The SilverStar Ultra bulb by Sylvania is one of the brightest headlight bulbs available that still meets the DOT regulations. Sylvania also provide other variations of halogen bulbs but the Ultra bulbs are the ones to go for. Overall, they are great all round bulbs but when you compared them against the Philips white headlight bulbs, they are fairly pricey. For those on a budget that are not looking for any sort of upgrade but simply want to replace their broken halogen bulbs, the VisionPlus is a great option. They are cheap headlight bulbs that provide up to 60% more vision on the road than standard halogen bulbs and are much cheaper than OEM bulbs from the dealership. Overall, if you are looking for the aftermarket replacement headlight bulbs that are cheap and a direct swap, these are ideal. You also have the peace of mind that they are built to a high quality as they are manufactured by Philips. The three most common reasons for changing your headlight bulb are because it is broken, you want more visibility or you want a white light output. Standard halogen bulbs are generally becoming phased out with most car owners wanting the modern bright white light. This can be achieved by using some of our recommended high-end headlight bulbs or opting for a xenon, LED or HID kit. Replacing your headlight bulbs is a simple modification that can make a huge difference to your visibility on the road. They can also improve the appearance of your vehicles when driving at night. Bulbs can break for a variety of reasons and finding the correct replacement can seem daunting when researching online. However, we have built a buying guide to cover all the factors that you should consider. Not all bulb sizes are the same and they vary from manufacturers. Common sizes are H7, H4 and H1 but some manufacturers may have odd sizes. When you remove your current bulb, the size will be stamped onto the metal part of the bulb construction. As you can see on the Philips bulb in the above photo, all the information is written on the side of the casing along with the DOT compliance stamp. If you cannot find the bulb size, check out Philips bulb size finder or try using Amazon’s car checker for confirmation before purchasing. To achieve the desirable white light output from your bulb, the color temperature needs to be between 3,000 and 4,000K on the Kelvin chart. Any higher than 4,000K and the light that is output will be nearer to a purple color. Lower than 3,000K will be closer to the standard yellow color output. The majority of LED’s such as license plate bulbs are between this color temperature range and matching all the lights together is highly recommended. If you are wanting to choose a color other than white, you will want to check the law within your states as many colors other than halogen and ice white are not road legal. 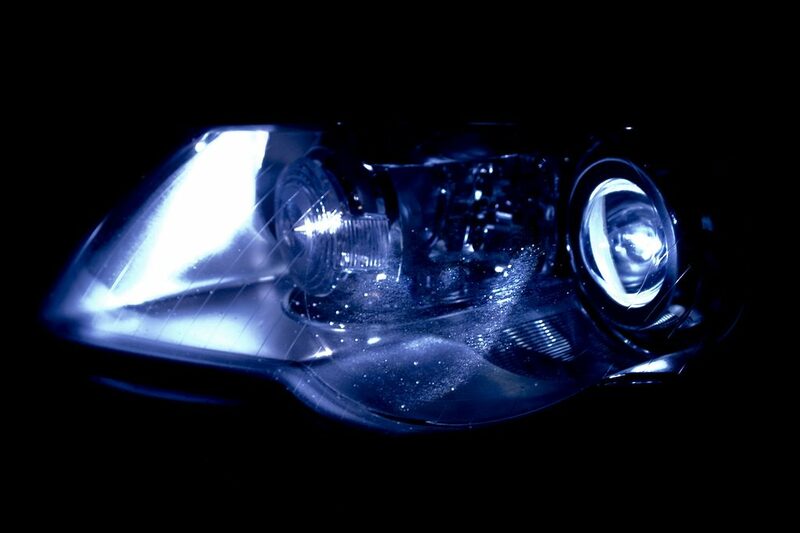 The lens of your headlight can also change the color of the light outputted from the bulb. For example, if you have neglected the lens and have allowed it to become cloudy from the UV rays, the output may be distorted as the beams passes through the lens. If this is the case, we highly recommend using a headlight restoration kit for maximum light output. Along with the color of the lights, you will also want to check the wattage. If you want the brightest headlight bulbs, you will need a high wattage bulb. Some manufacturers configure their bulbs so that they use more wattage when used as a high beam output. This will usually be stated on the bulb with wattage readings such as 60/55W, which is stated by the Philps X-treme Vision bulbs. The first digit refers to the high beam and the second is low beam. Turn all lights off and then open the bonnet. Remove the cover that holds the bulbs in place (Not all cars have this). 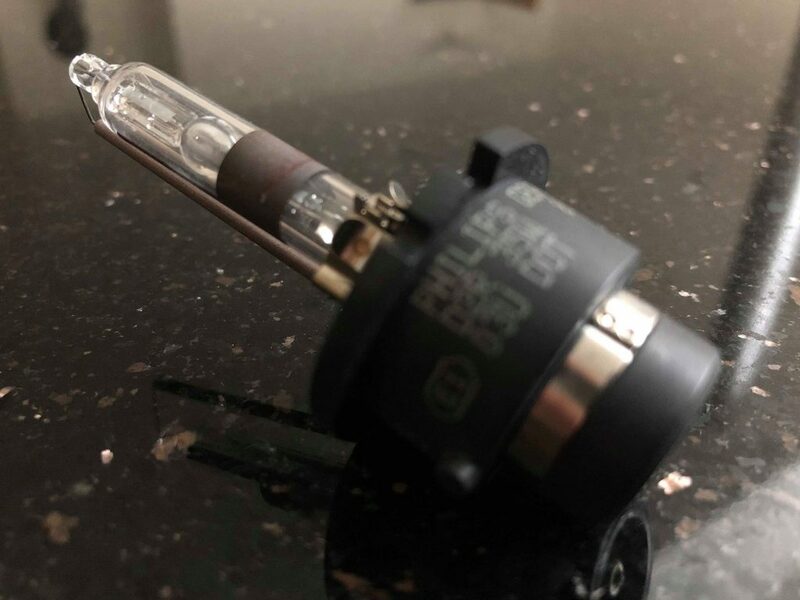 Remove the bulb from the headlight – this may need you to either turn the bulb holder anti-clockwise, push down on a small leaver or pulling up a leader (car dependent). Once the bulb is out of the headlight, pull the bulb away from the holder/wires. Fit the new bulb to the bulb holder/wires. TEST THAT THE BULB WORKS BEFORE MOVING ON. If the bulb works, proceed to carry out steps 1 to 5 in reverse. The 7 steps are fairly brief but you will be able to find much more detail within your owners manual. It is a quick and easy DIY task that we highly recommend trying yourself before paying to have them fitted. When it comes to step 5, you will want to be cautious at this stage. You should not touch the glass of the bulb and not use too much force. 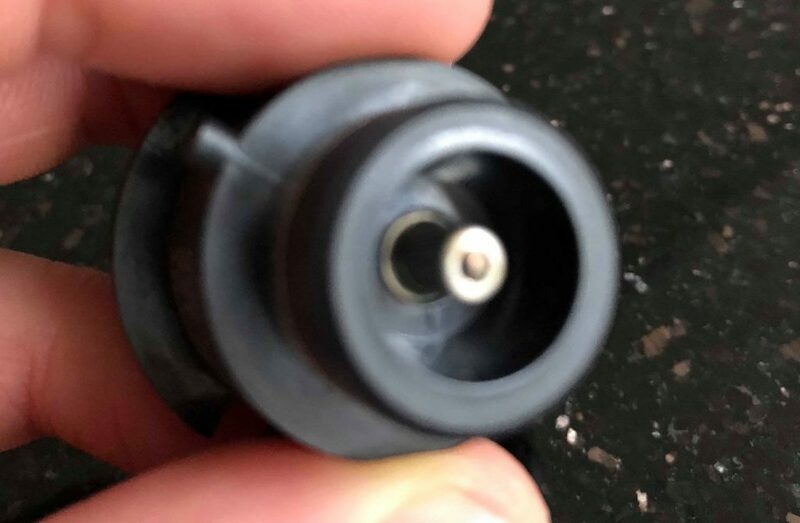 If you are trying to push the bulb in too hard, it could bend the connection and cause further issues. As you can see from the below bulb, it has been designed to be a “push fit” without any force required. If you find yourself forcing the bulb onto the holder, you may have the wrong bulb size. When it comes to the performance of halogen bulbs, the price you pay will make a big difference. High-end bulbs will use higher quality materials, which result in a brighter light that often lasts far longer. The standard halogen bulb will only last between 200 to 300 hours but all of the above headlight bulbs last 400 hours and longer. Another performance factor is the light output range, which can make a big difference for night driving. Investing into a quality bulb will increase your visibility on the road and will last much longer than cheap alternatives that are available. When upgrading your headlight bulbs, there are potential issues that may arise with the most common being a Canbus error. This will show as a light error on your dash and even when you try to clear codes with an OBD2 scanner, the bulb icon may still remain. The majority of the time, the bulbs will continue to run perfectly but the error code can be fairly irritating to look at whilst your driving. We highly recommend that any halogen headlight bulbs you purchase have “Canbus FREE” stated within the description in order to reduce errors from happening. Flickering of the light bulb or the light not being illuminated after flickering once is fairly common too. We would highly recommend that you check the connection with the bulb and the holder to ensure it is held securely. As there are three headlight bulbs that are highly rated within this article by Philips, its fairly obvious which brand we think produce the best headlight bulbs. They tick every box in terms of price, durability, reliability and performance. The X-treme Vision are the best performers but are limited in terms of bulb sizes. Alternatively the Diamond Vision are just as good but have a slight tint of blue to the bulbs. The above photo is of my old Volkswagen Golf that used the X-treme Vision halogen bulbs and they were a great upgrade that looked great. Upgrading from halogen bulbs has a range of benefits that goes much further than just the desirable color. All of our recommendations provide excellent performance and are suited to a range of budgets.